Elevation Change: 300' ascent to Grizzly Giant, 1200' ascent to Wawona Point. 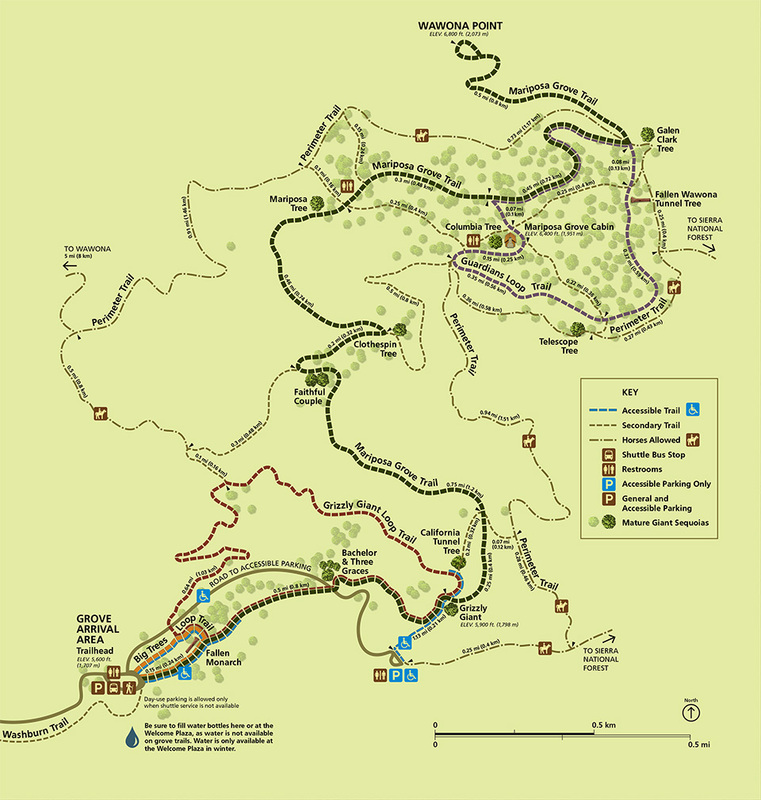 From the Grove Arrival Area, walk along the raised boardwalk of the Mariposa Grove Trail to enjoy the lower grove. Of note are the Fallen Monarch (a large fallen sequoia with impressive roots that can be seen up close along the boardwalk), the Bachelor & Three Graces, and Grizzly Giant (one of the largest trees of the area with a diameter of 25.5 feet and a height of 209 feet). Just beyond the Grizzly Giant is the California Tunnel Tree, one of the few surviving sequoias that was deliberately hollowed out so that tourists can walk through. For those looking to only do the short and easy hike, the California Tunnel Tree is a good turn-around spot. 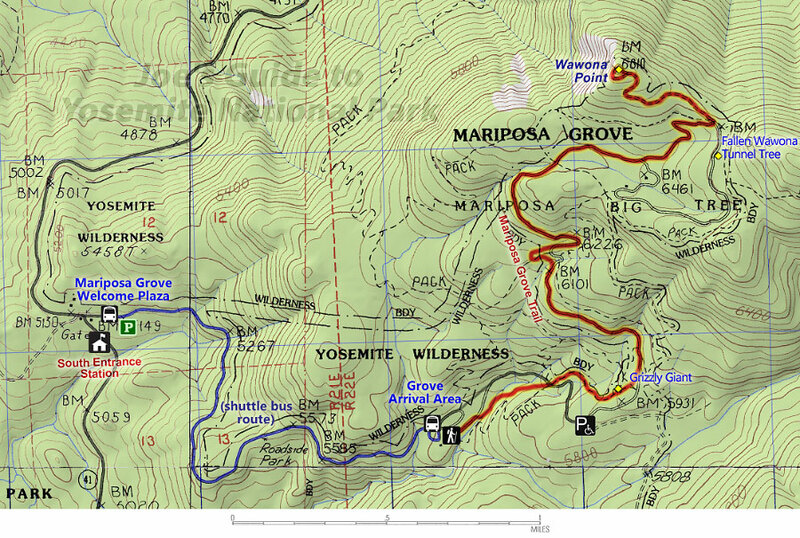 Continuing beyond the Grizzly Giant, the Mariposa Grove Trail becomes more strenuous, gaining over 1000 feet in elevation over the next few miles as it follows the old road. Along the way, you will see the Faithful Couple (two sequoias with intertwined roots and trunks that have seemingly melded into one tree), Clothespin Tree (a fire-damaged sequoia that looks like, you guessed it… a clothespin), and Mariposa Tree (another large sequoia that is the namesake for the grove). Soon after, you will reach the upper grove with an increased density of large sequoias amongst the other pines. 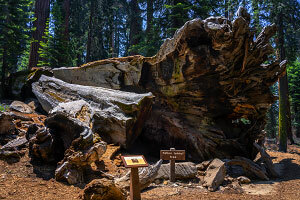 Beyond the Mariposa Grove Cabin (the site where Mariposa advocate Galen Clark built his cabin in 1864) and the Galen Clark Tree, a good destination is the Fallen Wawona Tunnel Tree (another majestic sequoia that was tunneled for tourism--more on that later). 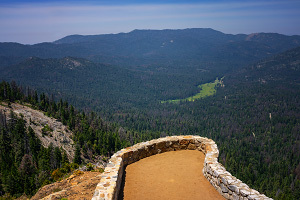 If you have extra energy, you can continue up the last .6 miles of the Mariposa Grove Trail to reach Wawona Point, the top of a ridgeline that gives an open view to the north. While the view isn't as jaw-dropping as viewpoints overlooking Yosemite Valley, it is still a worthwhile destination and a relaxing spot. 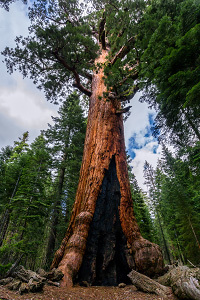 (While crowds of people visit the Mariposa Grove, very few make it all the way to the top.) For your return hike, consider taking one of the alternate trails like the Guardians Loop Trail, back down to the Grove Arrival Area. Pets and bicycles are not allowed on any trails in the Mariposa Grove and horses are only allowed on the Perimeter Trail. Drinking water is available at the Welcome Plaza year-round and at the Grove Arrival Area except during winter. Restrooms are located at the Mariposa Grove Welcome Plaza, the Arrival Area, and near the Grizzly Giant. In the upper section of the grove, seasonal restrooms can be found near the Mariposa Tree and the Mariposa Grove Cabin. Accessible Parking is available fairly close to the Grizzly Giant. The Big Trees Loop Trail and the Mariposa Grove Trail (especially the lower boardwalk section) are wheelchair accessible. The grove isn't just sequoias; sequoias grow scattered in the midst of other trees, including sugar pines, ponderosa pines, white firs and incense cedars. Ironically, the giant sequoias produce very small egg-sized cones while the more modest sugar pines are the ones that produce the giant 20-inch pine cones! Between 2015 and May 2018, the Mariposa Grove was closed for major renovations to make tourism less detrimental to the giant sequoias. To lessen the effect of vehicle exhaust, parking has been moved out of the grove to the new Welcome Plaza with a shuttle bus now providing access. Paved roads have been removed and replaced by boardwalks and dirt roads to minimize their effect of damaging the sequoias' shallow root systems. This is a far cry from the late 1800s when making "tunnel trees" was an accepted practice to promote tourism. The Wawona Tunnel Tree was tunneled in 1881 as a tourist attraction for people to drive their cars through. Later in 1895, the California Tunnel Tree was tunneled with a smaller hole for stagecoaches and pedestrians. While sequoias can survive with giant holes in them, it weakens their root system and makes them more susceptible to falling over, and in February 1969 during a winter of heavy snow, the Wawona Tunnel Tree did wind up falling over and dying; the tree was roughly 2,300 years old. 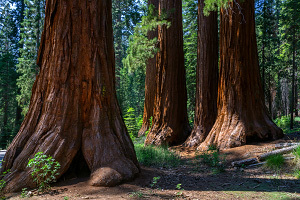 As barbaric as tunneling sequoias sounds by today's standards, ironically, America's fascination with driving cars through large trees helped get the Mariposa Grove protected by inclusion into Yosemite National Park in 1906. The California Tunnel Tree still survives, but it makes one ponder… what do we do and take for granted today that will be ridiculed by future generations? The Mariposa Grove of Giant Sequoias is definitely worth a visit, especially if you have the energy to hike to the upper grove. But as with all popular things Yosemite, there is a large potential for crowds and gridlocks here. Try to get to the Welcome Plaza early or later in the day and avoid summer weekends if you can.